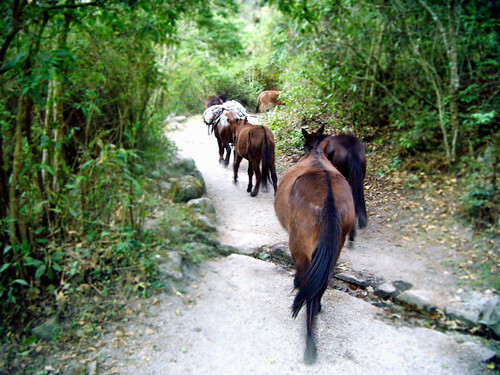 Horses on Inca TrailThis New Year's Eve carries extra importance. Sure, we'll make a resolution that we'll forget after a few flutes of champagne (new resolution: Drink less champagne). But kick the self-reflection into overdrive, because we're coming upon a brand spankin' new decade -- 10 years of resolutions for you to break. That's ten full years of regret! What's that? You don't make New Decade's Resolutions? Okay, we don't either. But think back about your most recent travel experiences -- the trials, the travails, that smelly hostel in Eastern Europe -- and you can probably imagine some changes you'd like to make before your 2010 itineraries. That's why we've polled our #traveltuesday Twitter community to kick-start the resolution train. They've got a message of hope to pass on to travelers everywhere, whether it's learning to pack less , finally booking that dream trip to the Mayan Riviera or learning new sports in different countries. As for us? Where I've Been plans on making 2010 the year of "you." We're working on bringing you our mobile application, more rich content, greater user functionality and making our app bug-free. How's that for optimism? Stay tuned to this blog for big announcements as the months pass. And without further ado, our tweets of hope and resolve in 2010. We've split them in two major camps for your viewing pleasure. Happy #traveltuesday! Sometimes it takes a clear goal of knowing exactly where you want to go in order to get there in the first place. Key places: South America, Trans-Siberian Railway, China, Japan. azcitychik I would like to go to Monument Valley in Northern Arizona and Zion and Bryce Canyon in Utah - want to see more of the outdoors charlanebrady taking my Mom to Ireland, Scotland and England in the fall... she's of Scots-Irish & English descent & always dreamt of goingmiladysiq Afternoon from my evening in Brazil! I'm planning on a trip to Uruguay, Argentina and Chile next April. Any ideas, please? MaxPilot The Sharrow Bay Hotel in the Lake District michelin star food beautiful views... Google it ;-)Typegeek I'm planning a trip to the Mexican Mayan Riviera. I've never been anywhere tropical before.GotPassport My Dear Asia, are you ready for us? We'll be there in 2010 to see you for as long as possible! with much LOVE!mclaughlins to do the trans-Siberian railway except starting in Glasgow! 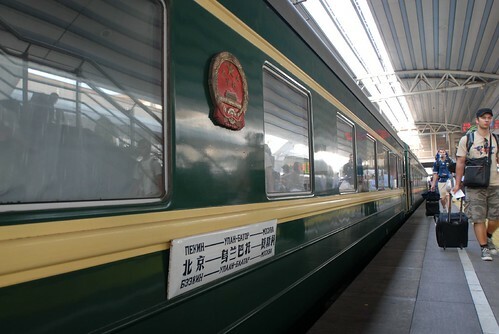 Trans-Siberian Railway car, ChinaJonathanDFW one resolution: get down to San Antonio to have fajitas y margaritas on the Riverwalk. Summer 2010.neilwhyler I'm finally going to do the trans siberian railway and see just how far I can get around the world without flying.20sTravel Save up the money I need for my RTW trip (and start it in Sept)!MichaelHales Hoping for Rome and or Japan in 2010 (+ more of New Zealand)blackgirlchi go to the Vancouver Olympic Games!brucepoontip I 'm taking two trips around new sports. Snowboarding in Japan & boxing in Thailandeppyboy I'd like to visit six new countries in 2010 and bring my total up to 50. Key themes: Cut down the pace, cut down on luggage, cut down on budget. DTravelsRound : 2010 res - to travel smart. no excess spending. and to give back to the places i visit as i go. Any of these resolutions look remotely similar to goals of yours? Resolutions can be a tricky and frustrating thing, particularly if your original goals are already laced with doubts. But if you set the bar at a position that is reasonable, resolutions start to become something a little less like something to scoff at and an altogether more enriching exercise. What are your 2010 travel resolutions? Agree with any of the tweeters above? Still think the resolution train is a hunk of baloney? Have your say in the comments. Special thanks to all who contributed -- let's make #traveltuesday even more community-oriented in 2010, whaddya say?